I sauteed some garlic and added Salsa Amaya (you can replace this with bits of dried fish, sardines or anchovies in oil) and tossed it with the pasta and some chopped fresh parsley. The parsley adds a zest and great color to the pasta. 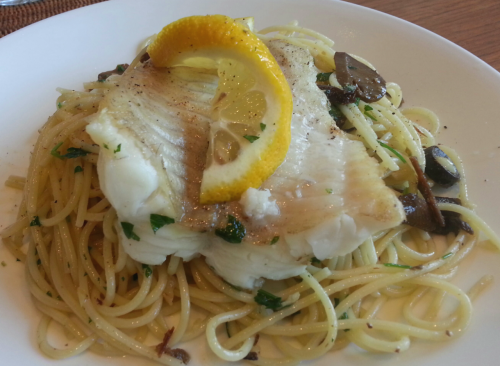 I set the seared catfish (salted and cooked in oil and high heat for three minutes on each side) on top of the pasta. I served it with a slice of lemon for good measure. The wife loved the creation! Being able to make these dishes at home makes it incredibly hard to commit to going out for dinner. Cook pasta according to package directions and drain. In a small pan, saute garlic in olive oil and add Salsa Amaya or dried fish. Season with salt and pepper and set aside. Salt the fillet on both sides. In another non-stick pan over high heat, sear the fish for three minutes on each side, longer depending on the thickness. While this is cooking, mix the olive oil and garlic sauce into the pasta in the original pot or another bowl, mixing in the chopped parsley, salting and peppering as needed. Set the cooked fillet on top of the pasta split into two servings. Squeeze some lemon over the fish and noodles and serve with a lemon slice.